You may have noticed that the site has been on a bit of a 1911 kick lately. Caleb has decided to test out a couple of 9mm 1911 pistols. He even invented a rating system to give some sort of objective score for the guns he’s testing. I’m probably partially to blame for that. In November of 2014 I took a friend of mine to run a half marathon in Richmond, Va. When he finished up I stopped in at Colonial Shooting Academy to say hello to a good friend of mine who works the gun counter there. They have a pretty solid selection of handguns, including an entire display case of 1911 pattern pistols. My friend, who we often refer to as “El Diablo” because of his knack for dangling shiny temptation in front of his friends, knows my weakness for John Moses’ semi-automatic Peacemaker. He began taking guns out of the case and handing them to me. 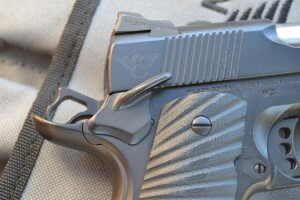 In the course of the conversation I mentioned how Todd Green’s experience with the Warren spec 9mm 1911 had me thinking hard about the 9mm 1911 as a concept. I never thought about investing in one until I saw Todd’s test and how much he loved the gun. “El Diablo” sensed his opportunity and handed me a Wilson CQB in 9mm that he had just received in the store. I was a goner the second I held it. By the end of the day I had put down a deposit on the gun and I was listing a bunch of stuff on Gunbroker to pay for it. 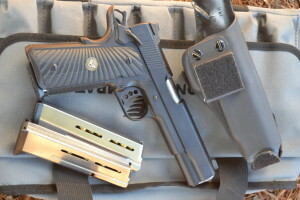 Since I’ve been living with my Wilson for more than a year and since we’re on a 9mm 1911 review kick lately, I figure why not write one for the CQB? 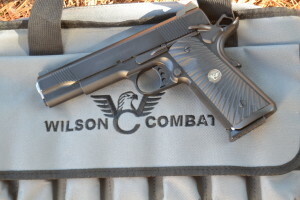 The Wilson CQB exhibited superb accuracy from the very first shots. I didn’t have the chance to shoot the pistol until a few weeks after I’d purchased it, deep into December. The first thing I wanted to do was make sure it actually worked properly, so I loaded up a magazine of American Eagle 124 grain FMJ ammo and asked my buddy to stand by and watch for inconsistent ejection. (This is part of the 10-8 test, you’ll recall) The first shot I attempted was from the bench while wearing heavy gloves. I couldn’t really get a solid grip on the gun and I felt it shift in my hand right at the point of ignition. For the next five I ditched the gloves and fired off-hand at the 25 yard target. I had a moment of panic because it looked like I wasn’t even on paper. My mood improved dramatically when I got closer to the target. My big worry with a 9mm 1911 was whether or not I could get one that worked. Todd’s test was really an eye opener for me because prior to that I believed the conventional wisdom about the inherent unreliability of the 9mm 1911. I didn’t want to spend money on a 9mm 1911 and have to futz with annoying details like figuring out what magazines the gun would like. I figured if I bought a Wilson gun and fed it with Wilson magazines, it should work reliably. With more than 3,000 rounds through the gun at this point, that has proven true. The pistol has not experienced a single stoppage or malfunction. The pistol came with three 10 round magazines and I ordered seven more after purchasing the pistol. It looks, though, like Wilson has actually changed their 9mm magazines since I bought mine as mine all have plastic followers and no numbering stamped into the body of the magazine. Even so, none of the magazines have given me any problems. I performed the 10-8 function test on the Wilson recently and it passed with a perfect score. (I had performed bits of the test when the gun was new, but I didn’t go through the one reload one section of the test at that point) Even with no magazine in the pistol, ejection is positive and consistent. In 2015 I used the Wilson in multiple class settings including Intensive Pistol Skills with Tom Givens, Concealed Carry: Vehicle Environment Skills with FPF Training, and Concealed Carry Foundation Skills with FPF Training. The pistol performed splendidly in every class, never giving me a moment’s trouble. 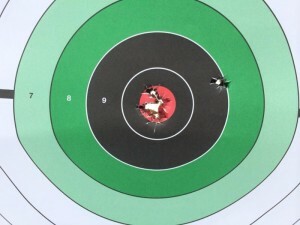 The only unusual moment I’ve experienced on the range with the pistol came during the Intensive Pistol Skills class. On a string of fire calling for a reload, I ejected a partially loaded magazine and somehow when it hit the ground it managed to flip the top round in the magazine backwards. I have tried, but I haven’t been able to make this happen again. 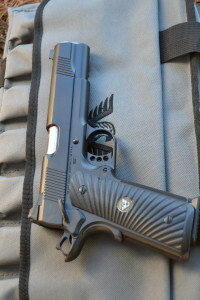 When Todd Green told me that he was going to do a 50,000 round test on 9mm 1911 pistols, I laughed. I told him I couldn’t wait to check in on his site and read about how the heinously unreliable pistol was making his life a little more miserable with each new week. It didn’t turn out that way for him and thankfully it didn’t turn out that way for me, either. My Wilson CQB has been one of the most boringly reliable pistols I’ve ever purchased…which I’m quite chuffed about. I haven’t cleaned the pistol. Ever. I have kept the pistol lubricated with Wilson’s Ultima Lube. The CQB is an all steel gun and as such you do need to pay attention to lubrication. 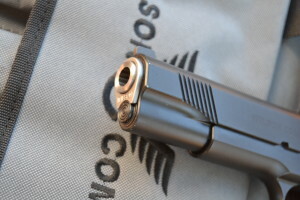 The “Armor-Tuff” finish on the pistol is impregnated with molybdenum (a substance used in quality motor oil to prevent metal wear and friction in your engine) and likely provides some room for error if you were to under-lubricate the pistol, but your ownership and shooting experience with a 1911 will be dramatically better if you properly lubricate the pistol regardless of how awesomely functional the finish may be. I haven’t done anything to the pistol other than lubricate it and shoot it. Although with more than 3,000 rounds through it I will likely replace the recoil spring and Shok-Buff soon. A little bit of wear on the high points of the slide are evident after thousands of presentations from a kydex holster. The quality of the pistol is superb. There are no cast or MIM parts on the gun. When you handle the gun it’s readily apparent that somebody sweated the details. One of the first things I check when I handle a 1911 pistol is how the grip safety is fitted on the gun. Many 1911 pattern pistols are shipped out with a grip safety that has to be pressed just so for it to reliably disengage and allow the weapon to fire. I often encounter people who say they don’t like the 1911 because they struggle to reliably disengage the grip safety when presenting the gun in a hurry. Sometimes that’s due to physiology, but often when I’ve checked out the gun they are using I find that the grip safety has not been properly designed or properly fitted. The end result is that they present the pistol from the holster and you watch them press on a dead trigger and then begin to futz with the thumb safety trying to correct the problem. You don’t get any of that with this CQB. 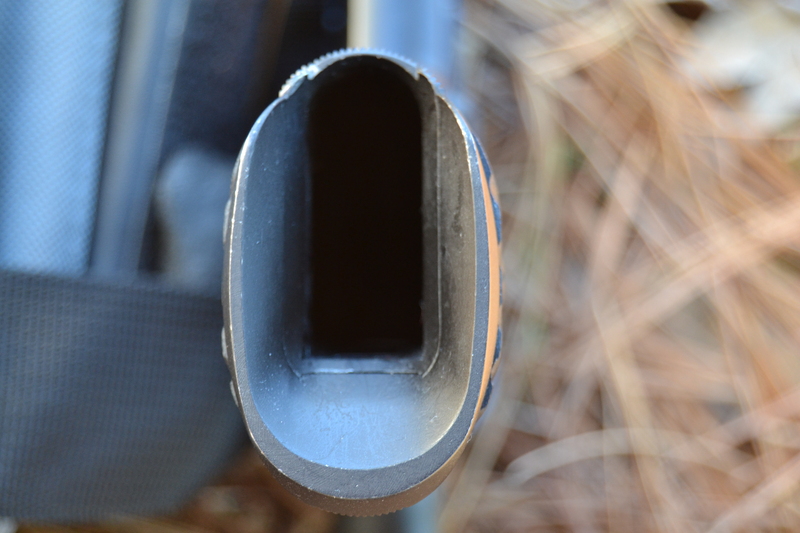 The grip safety reliably disengages no matter how bad a grip I have on the gun. That only happens when someone actually takes the time to fit the grip safety properly. Doing so requires patience and a process of putting the part on the gun, testing for function, and then removing the part and filing on it just a bit more. Then lather, rinse, repeat until the part works properly. I’m certain that the experienced smiths building the Wilson guns using parts of known specifications and quality have become very efficient at performing this process, but it still takes a bit of patience to get it right. The Wilson Bullet Proof tactical ambidextrous thumb safety is fantastic…especially if you are a lefty. The thumb safety is one of Wilson’s Bullet Proof units with the “tactical” extended levers. Generally the ambidextrous safeties you see on 1911 pattern pistols are Swenson style. Wilson took a fresh look at the 1911’s thumb safety and designed an ambi safety with a lot more contact between the two halves of the safety, making the whole arrangement stronger. 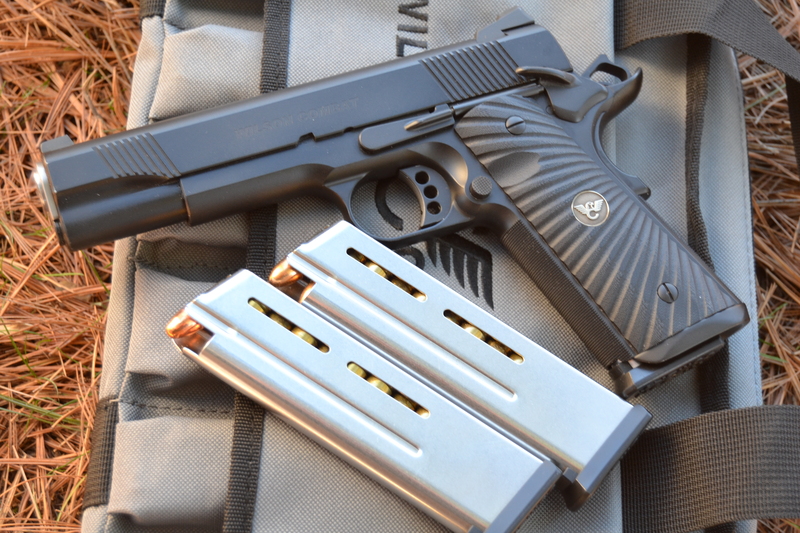 If you are left handed or do a lot of left handed shooting with a 1911, you may want to give the Wilson Bullet Proof levers a hard look for your pistol. The sizing of the “tactical” levers is perfect. At first glance I thought they would be too small to reliably disengage from the draw because I’ve been spoiled by the wider levers of the typical Swenson-style safeties used by other manufacturers, but hands-on time with the “tactical” levers has converted me. They are sized perfectly for my needs and the smaller profile helps the gun ride a little more snugly against the body when carrying concealed. 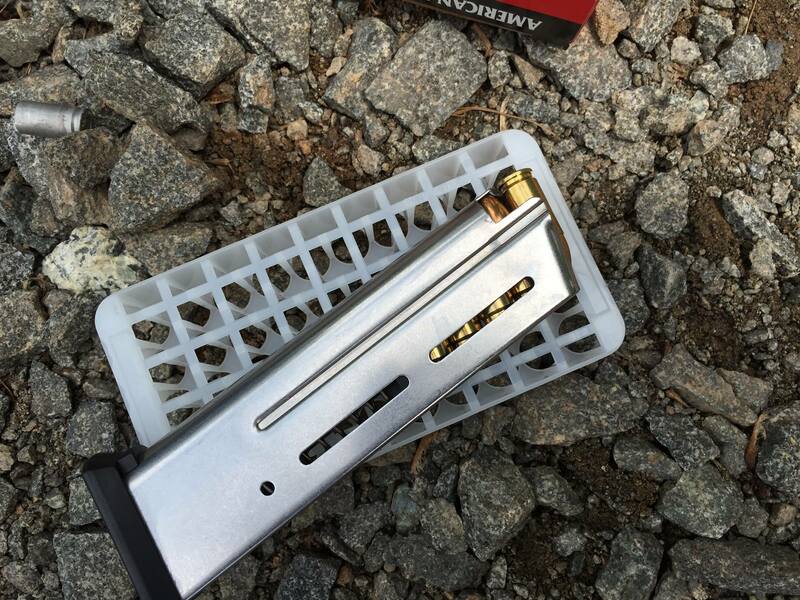 This pistol holds ten rounds in the magazine and one more in the chamber. In the classes and range time I’ve done with the pistol I’ve felt the absence of those extra double-stack rounds on more than one occasion. Tom Givens has said multiple times that his rule of thumb is to count on it taking about 5 rounds from a pistol to convince a bad man to stop what he’s doing. With that math, the 1911 in .45 ACP is a one bad guy gun. This pistol with the ten round magazines is about a two bad guy gun. The capacity is right on the margin for what I’m comfortable with in a carry gun. 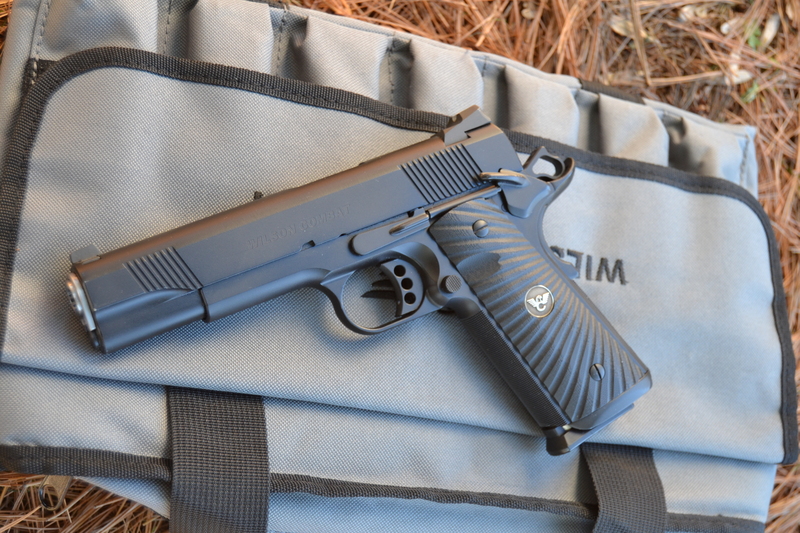 I’m a big fan of the mag well on the CQB…any 1911 I get in the future will have one. The capacity concern is somewhat ameliorated by how easy it is to precisely place a bullet with this pistol. The trigger is superb with just enough travel to let you know you’re actually pulling the trigger and a clean break. 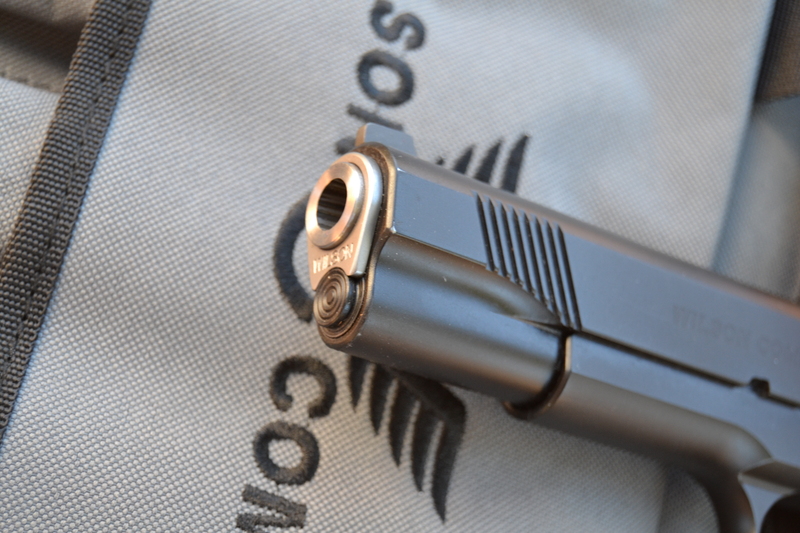 The excellent trigger combined with the good sights and the pistol’s mild recoil make it an absolute joy to shoot. If you told me I had to take a hostage shot, this is the pistol I would want to use. My hope is that should I ever need to use this pistol in self defense, I can place every shot in an area that counts so that it takes less convincing overall for the bad man to stop his obnoxious behavior. If you’ve never fired a 9mm 1911 pistol, you should. It’s not, as many suppose, like shooting a .22LR. It still feels like a reasonably powered center-fire handgun, but it stays put in your hands during recoil and you don’t have to contend with much muzzle rise. It’s almost like cheating. This pistol is expensive. Make no bones about it: You can buy two Glock 19’s, new sights for them, a holster, spare mags, a couple of thousand rounds of ammo and a good class for what it cost to just buy a CQB equipped this way. This pistol will not kill bad guys any deader than those Glocks will. You do not buy this kind of pistol because you are looking for the most practical purchase you can make, at least not unless you are faced with extraordinary physical circumstances that makes the shootability of this pistol more of a necessity than a nicety. 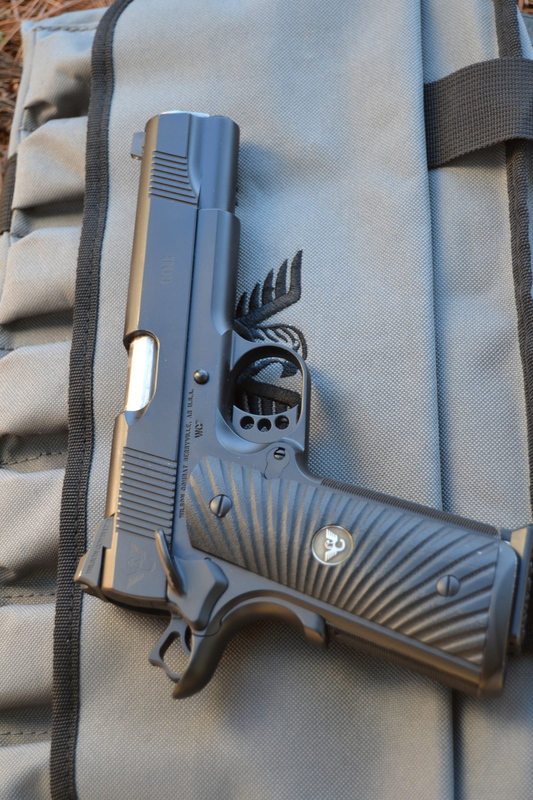 I didn’t buy this CQB…and let me be absolutely clear that I bought this gun myself without any discount from Wilson Combat…because I needed a practical 9mm pistol. I bought this pistol because I really like it. I enjoy owning it more than I enjoy most of the guns I’ve owned over the years. I enjoy shooting it more than I’ve enjoyed shooting most of the guns I’ve owned over the years. When I was listing my lovely 6″ nickel-plated S&W model 27 to help pay for the Wilson, I wondered if I would eventually regret the decision to part with such a nice revolver. The answer is no. Not even for a second. I liked that model 27, but I never fired it. (Seriously…I never busted a cap through it. It was too pretty.) I’ve used this CQB like I would any of my carry guns and I’ve enjoyed every bit of it. For me, this pistol was absolutely worth the price. As I mentioned in the opening paragraph, this is a pistol I bought off the shelf at a store. It was an impulse purchase. Ordinarily when you buy a Wilson you spec out the gun to your preferences and wait a while (quite a while, sometimes) to get the gun. I honestly believe that if I hadn’t had the pistol in hand I wouldn’t have purchased it, so I certainly don’t regret the purchase at all…but there are some things I would do differently if I was ordering the gun directly from Wilson. No checkering on the front strap. The checkering on this pistol is superbly done (whether by machine or hand I don’t know…likely by machine) but I am not a fan of front strap checkering on a 1911. I don’t find that it really aids my strong hand grip on the gun, but it does make me bleed after a longer range session or during a multi-day class. Recess the muzzle crown. Mainly to add a little bit of protection to the crucial crown of the muzzle against impact, but also because it-looka-nice! Ball cuts on the slide. Purely an aesthetic preference. Solid trigger. Again, purely for aesthetic reasons. I really prefer not to have the speed holes in my 1911 trigger. No CQB logo on the slide. Aesthetic reasons. Using Caleb’s rating system, the CQB scores an A+ 100/100. It passed the 10-8 test with flying colors, and hasn’t ever failed to fully cycle when firing with a variety of JHP and FMJ ammunition with more than 3,000 rounds through it. It’s made to an exceptionally high standard and every little bit of the gun works in splendid harmony with the rest of the pistol. It’s laser-beam accurate and an absolute joy to shoot. It has become my primary carry gun, carried in the excellent Keepers Concealment “Keeper” holster. The thin profile of the single-stack 1911 and the nicely designed holster make every day AIWB carry a breeze, even for such a big, relatively heavy pistol. The only real downside to this Wilson is that you could literally buy half a dozen other pistols for the price of this one gun…but if you are a 1911 guy odds are that none in that half dozen will tickle your fancy quite the way that this one can. This should also remind everyone that guns that look similar on the outside are not necessarily alike. There are a lot of 1911 pattern pistols on the market but while they may look very similar there are a lot of important differences which are evident in the price and performance that they offer once you get them out of the gun store. Apparently January 21st is John Moses Brown’s birthday. I didn’t know that when planning this article, but I’m rather pleased it worked out that way. I keep a list of firearms and their model numbers, etc I’m interested in purchasing. Every few months, usually around the first of the year or around Shot Show announcements I’ll update my list. I was looking over the list yesterday and at the top is a WC 1911 CQB 9mm. Your article is not making my life any easier. Insert emperor Palpatine meme here. But everybody knows that the only reason to put up with finicky, high-maintenance* Taft-era technology is because it shoots the super-awesome .45, which will throw you through the nearest plate-glass window if it hits your finger! Shooting the wimpy effeminate Europellet through JMB (pbuh)’s divinely inspired creation is sacrilege! * Of course, you can tune the 1911 so it’s 100% reliable in all conditions. For the price of four Glocks. Many websites say he was born on the 23rd of January; or maybe he was born again then?